A friend of mine is having dinner with a group when the topic of cider comes up. One guy pipes up, “I only drink IPA’s.” My friend asks him if he’s ever had different kinds of ciders, to which he replies, “Yeah I’ve had them, they’re all way too sweet.” Dear reader, it is at his moment that I would like to beseech you to never be the dumpster-fire-full-of-douches called “I only drink IPA’s” guy. Be better than that. People who say that are trying to lord the idea of a sophisticated palate over you, when he’s really just got the taste buds of a fat and lazy koala bear who only eats the finest eucalyptus leaves. You may as well just eat chicken strips and fries every meal, because you have the tastes of a child. One that drinks beer. But only IPAs. And probably calls his meal “a deconstructed, fried breast of chicken with pomme frites.” The guy that drinks only IPAs was drinking only PBR two years ago, so he needs to shut his pie hole about ciders being too sweet. He obviously doesn’t know what’s good in life because ciders are amazing. Nine years after the pilgrims arrived at Plymouth, they finally took to planting apple trees in the Massachusetts Bay Colony (probably because they were sick of not having cider). Cider became a staple of colonial life, equaling beer in its popularity. There’s a distinction to make when talking about juice vs cider. Pressed apple juice can be called fresh cider or sweet cider, but hard cider is strictly about juice after it’s been fermented. Apple juice becomes alcoholic when yeasts inoculate the liquid and begin consuming the sugars and breaking them down into ethyl alcohol. Before yeast banks stored cultures for commercial use, people would just take their fruit juices and wort to a field or orchard, and leave them out in wide, open containers for wild yeasts to land in. Today, we’d call this spontaneous fermentation, but back then, I’m pretty sure they just called it fermentation. It’s a process still used today by makers of sour ales and ciders and is one of the ways to give a cider depth and complexity. Many people who don’t like cider are used to the idea of Angry Orchard being what one tastes like, but that’s like saying Corona is what beer tastes like. It’s a mediocre example of a mass marketed brand that in no way should define what a drink in its best form tastes like. Much like champagne, ciders can range from cloyingly sweet to bone-dry. Sparkling apple juice is often used as a non-alcoholic substitute for champagne when celebrating and could possibly be a reason people have such a misconception of what cider is. A well-made, real cider can have all the flavor and nuance of a well-made champagne and should appeal to wine drinkers in the same way that sour beers do. Much like with sour beers, a variety of fruit can be added to apple cider to create a Hodge-podge of possibilities. A recent trip to the pacific northwest became an investigative research expedition to discover new and exciting small batch ciders. 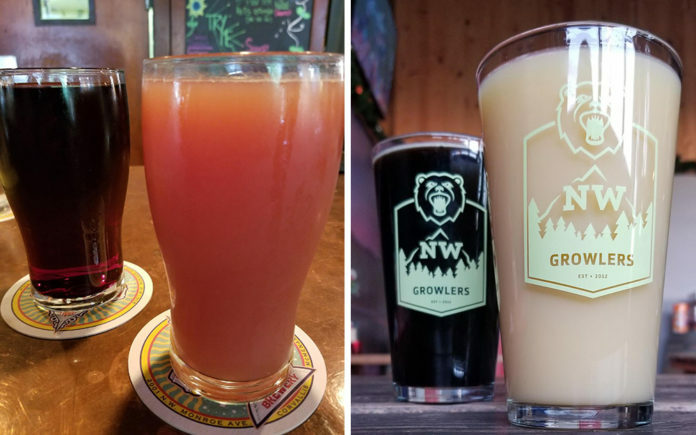 A trip to a Mcmenamin’s Market Street Pub in Portland OR revealed how adventurous craft brewers are reshaping the way people look at ciders. Joined by my cider expert friend, Darla, we sampled a variety of fruit ciders, including one called Crangerine Dream. A blend of 10 apple varieties as well as orange, cranberry, and tangerine juices, it was a far cry from the mass-marketed ciders available in grocery stores. “It’s very complex,” said Darla, of the Crangerine Dream cider, “I can taste all the flavors going on here, but at different places.” The blood orange cider was also nicely done with flavors that married perfectly, although Mcmenamin’s blackberry cider tasted like cough syrup. We jaunted over to another brewpub that served us a different blackberry which tasted much better than that first one did. They had an Orange mimosa cider on tap, as well as a Rhubarb. Both were excellent, with the Orange Mimosa having the thick, milky appearance of a horchata. I left the PNW behind with a much richer knowledge of what defines a cider but returned to a town that still thinks Ace Cider is the be-all, end-all. Lucky for us, we have Total Wine and More. Total Wine carries a wide variety of imported and craft ciders (as well as Redd’s Wicked Apple if you hate yourself and feel like you don’t deserve nice things), including the acclaimed Rekorderlig ciders from Sweden, and Oregon’s adventurous 2 Towns Ciderhouse. They’re the perfect drink to have when a beer doesn’t sound quite right for the mood, but sparkling wines are too alcoholic. Fans of sour beers are probably already fans of ciders, but the tart, acidic nature of a cider would feel right at home with someone who enjoys the brightness of a fruit sour beer.